Wire Mesh Partitions & Fencing offer versatile and economical solutions to a broad variety of storage needs. Cranston Material Handling of Pittsburgh works with top manufacturers of wire mesh partitions to design fencing layouts that create safe and secure areas in your facility. Wire Mesh Partitions & fencing can manufacture from several types of material. Talk to Cranston Material Handling of Pittsburgh to discuss what type best suits your requirements. Six-gauge woven wire mesh: in a 2-inch by 2-inch square is the strongest and sturdiest type of wire mesh. Often used in government facilities, import/export areas and anywhere requiring high security and control. Eight-gauge woven wire mesh: in a 1.5-inch by 1.5-inch square is a healthy choice when a smaller opening is required. Medical and pharmaceutical companies commonly use 10-gauge woven wire mesh: in a 0.75-inch by 0.75-inch square as it prevents the passing of pill bottles and also by facilities to protect computer servers. 12-gauge woven wire mesh: in a 0.5-inch by 0.5-inch square is typical in cases that require security from small items interfering with machinery. This mesh size prevents the passing through of a dime, or other small parts or items. 10-gauge welded wire mesh: either 2-inch by 2-inch square or 1.25-inch by 2.5-inch rectangles, welded wire mesh is lighter than woven because the wires are welded at every point of contact instead of crimped together. Famous for storage cages, tenant lockers, pallet rack enclosures, etc. The square welded mesh meets the RIA (Robotic Institute of America) standards for machine perimeter guarding. Alternative mesh types: Mesh is also available in 16-gauge sheet metal, expanded metal, and clear polycarbonate for use in wire partition products. 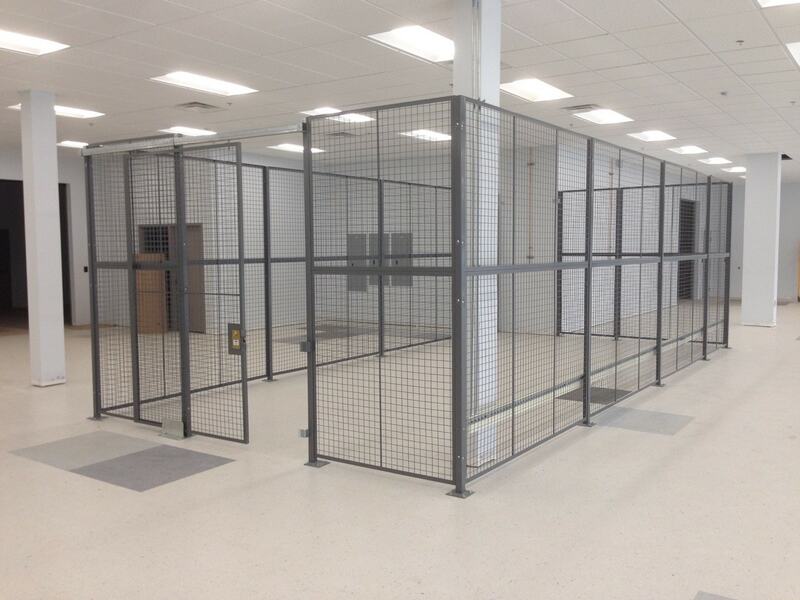 Wire Mesh Partitions & Fencing Provides High Security and Safety for a wide variety of tasks. They may have panic hardware on doors to facilitate rapid egress to card reader access locks. Also, there is a wide range of other options to meet your needs. Talk to Cranston Material Handling of Pittsburgh to discuss your exact requirements. Design and Installation are available for all your wire mesh partition & fencing needs. At Cranston Material Handling of Pittsburgh will listen to all your concerns and expectations. From there we can design a solution that fits your space, budget, and specific requirements. 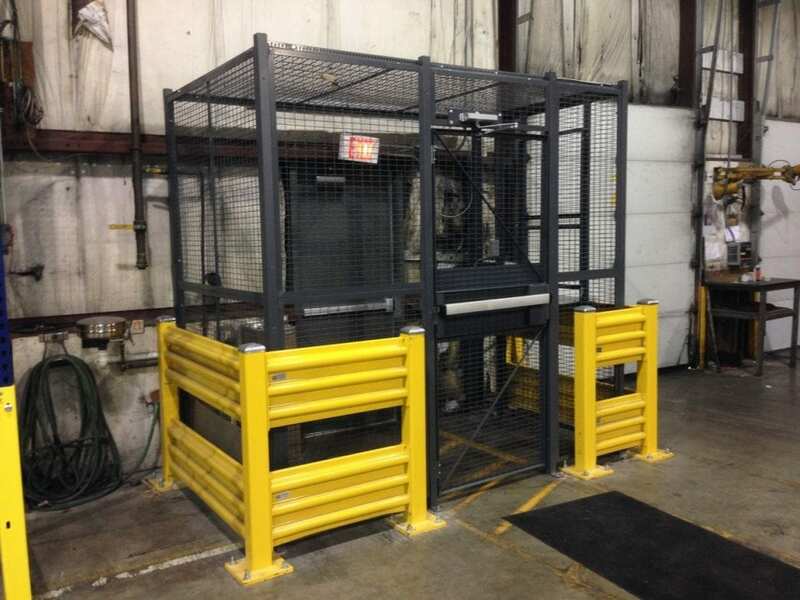 You can trust Cranston Material Handling of Pittsburgh for a quick and smooth installation. We have decades of experience installing a wide variety of fencing to safely and securely protect your products and work areas. Cranston Material Handling of Pittsburgh, Pennsylvania is known for offering the highest level of professional consultative sales and service of industrial equipment, project management and equipment installation in Southwestern Pennsylvania. To speak to an experienced material handling professional about your project or need, call 412-741-8060 today!